I’m determined to hold up better today than I did yesterday. I take a deep breath. I sink into my seat. 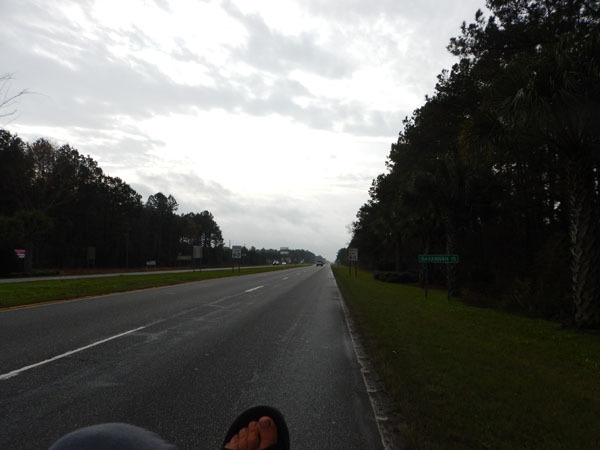 I put my right foot on the pedal, set in the power position, of my recumbent bicycle. And then I pushed off. By the time I reach the 60 m.p.h. sign, the paved shoulder starts fizzling. Then it disappears. Whenever I look in my mirror, every few seconds or so, I see Lothar behind me, holding the lane. And I imagine that he’s hoping too; that I’ll keep it together, that is. I could write an entire post about the character, or lack there of, roads in South Carolina from a cyclist’s perspective. This one goes from 1 foot to 0 feet before my muscles have even warmed up for the morning. “Break it down like you are running a whitewater river,” he said last night. 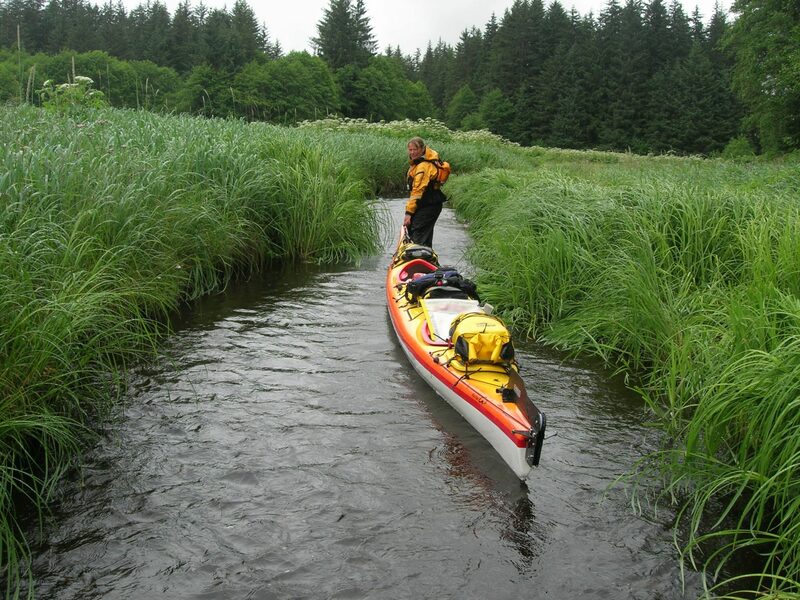 I responded in protest, “But my comfort zone is Class IV whitewater rafting and yours is Class V whitewater kayaking. It’s not the same for me as it is for you.” Regardless of how we both feel, today I’m at a crux. And I just need to stay on my bike long enough to get to Savannah, Georgia. Yes, that sign say 60 m.p.h. and I’m supposed to ride on it with no shoulder! Some of you will get how I feel and others will not. 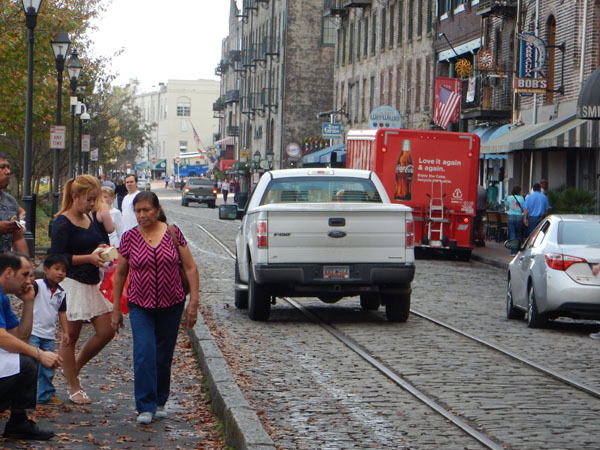 Savannah. I love that name. And Georgia, or Joe-Ja, as Lothar and I have been fondly calling it for the last three states (Virginia, North Carolina, South Carolina) that we have ridden through since we left Washington, DC., somewhere around a month ago. 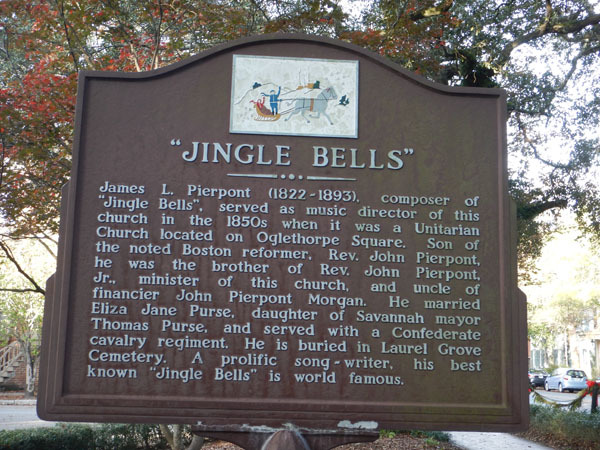 Savannah, Georgia. I have read a lot about this place and how magical it is. I badly want to get there—preferably in one piece. I have negotiated my way over, under, around and through lots of cruxes on various adventures but this one is a far cry from any other. 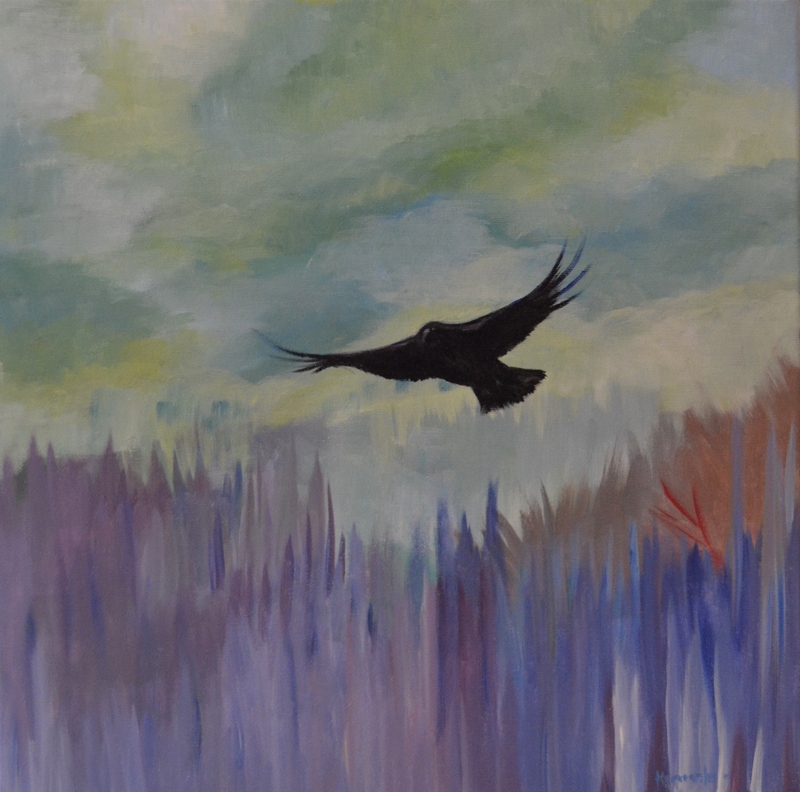 I’m used to hazards that I can assess and manage, keeping within my realm of risk tolerance like those associated with making my way up a cliff face, or down a river rapid, or across an ocean gap, or through braided back channels with scatterings of fishing grizzly bears. But to face (or rather to put my back to) thousands of people encased in metal and plastic, individually or in small groups, hurtling down the highway goes against the grain of my existence. Particularly, when I’m seeing so many drivers talking on cell phones, some even texting. When randomly the odd person shaves by me or blares their horn as they pass, it triggers a visceral response that cuts to my core. I’m terrified. Sometimes, I bail by launching my bike into the grass (thankfully it’s easy to do). Sometimes, I fight back by yelling at people that can’t hear me and don’t care, anyway. Eventually, I notice that deep breathing is my innate coping strategy. Long silent inhale. Long loud exhale. But it is a far cry from the breathing to relax that I was taught in Yoga. I’m dimly aware that it might be making the situation worse but I do it anyways because to stop it would be more mental energy than I can muster. I keep riding, looking in my mirror, bailing off the road and into the grass when people take longer to change lanes than I can hold on for, and then working my way back onto the road when it’s clear. I’m sweaty from riding in the grass plus it’s a humid 26C and I’m exhausted from forcing my body to do what my mind won’t tolerate. Meanwhile, Lothar calmly and patiently holds the lane behind me; he’s ready to bail at the last second, which thankfully he hasn’t had to do yet. He’s managing his risk well like many expert cyclists do. I’m not. A horn blares—one, two, three angry blasts—from a truck approaching, passing, and then accelerating past me; it’s a tow truck with two mangled vehicles on deck. Rocketing off the road—before my terrified mind can catch up with my body to tell me that now he’s finally moving into the left lane—and lurching to a halt, I leap off my bike. I start walking. I rethink my options: its a short day. I should be able to wiggle my way through this. We’ve ridden 9.5 km and we only have somewhere around 15 km to go. I comfortably hike four kilometres per hour when I’m working in the bush. It’s a bit of a struggle pushing my bike in the grass. I think that I can walk three kilometers per hour. So it will only take me five hours to get to Savannah. I’ll be there just before dark. Thoughts of having overestimating how fast I can walk and the prospect of blisters from my cycling sandals niggle in the background. All I want for Christmas is to not be here in this place. Not now. I walk for ten minutes, settling into my decision, when I realize that a vehicle has pulled off the road behind me. I look back to see a big white pick-up truck. The dam bursts. Tears flow. Now I’m feeling embarrassed because I’m thinking this poor fellow is thinking that he’s encountered a real crisis. 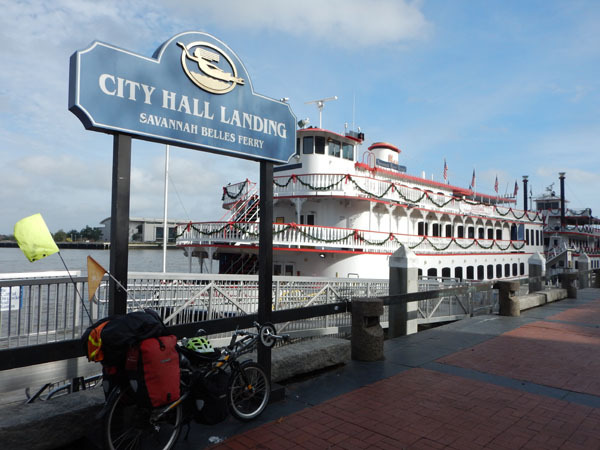 With an apology and smattering of details, he kindly offers us a ride into Savannah. Excited, I accept the offer; I just need to check in with Lothar who is now just ahead of me waiting patiently. Then I read, the crest on my rescuer’s shirt, “Good Shepherd Pet Services.” Fitting. Lothar and I can’t easily pack both of our bikes into the short box pick-up truck, due to the solid cover. 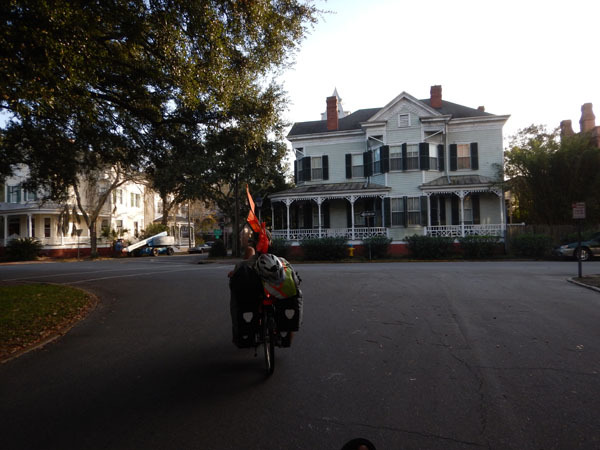 Lothar says he’s happy to ride and I leap to take the ride into Savannah, relief for both of us. This situation fits the umbrella of a theme that this bicycle adventure of ours has produced, as if it was orchestrated. 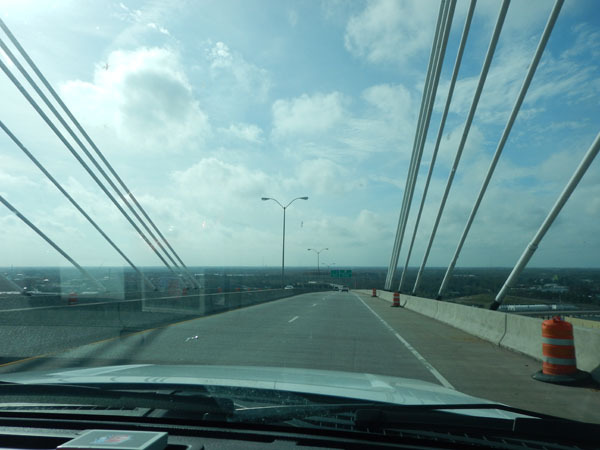 In the last few days, we have encountered some of the nastiest drivers we’ve encountered yet but again and again we are learning that it’s also true what they say about the outstanding hospitality of southerners. When adversity rises, opportunities follow. The coastal terrain that we’ve been travelling through the last few weeks might be predictably flat but incongruities on a number of fronts abound in the southern U.S.A. They more than fill the physical void that I felt when we completed riding up and down hills—hill after hill after hill—around the Gaspé Peninsula, Quebec, with the psychological gymnastics of traveling through landscapes and communities that are vastly different, yet vaguely familiar to, from where we come from. But these stories are for another blog post. At the end of the day, yesterday, another psychologically challenging day of negotiating road hazards, I surfed the net (yet again) desperate to find someone, anyone, with wisdom to impart about an easy way to ride through South Carolina and Georgia. Instead, I found account after account of the challenges including a recent post on a forum from a seasoned bicycle tourer that was thinking of bailing from his trip down the east coast of the U.S.A. because he was finding the roads more hazardous than anywhere else he has ridden. I reflected on what I read. I’d be crazy to keep going. Now I reflect some more. The only continuities in this adventure of ours are that the vast majority of people that we are encountering are remarkably interesting, generous and compassionate, and that change is perpetual whether it’s the local climate, geology, ecology, terrain, culture, economics, or usually a vibrant and unique combination thereof. Despite some of the intense challenges I have encountered, it’s a curious combination of the benefits that keep me going—the stories that have unfolded for us; our deep, albeit brief, connections with many of the people we have met (I feel like my community is in an exponential growth phase); the diversity of landscapes and communities that we are travelling through; and an insatiable curiosity that I have about the commonalities and differences in the challenges that people and communities are facing from social–ecological perspectives. These are the things that jig me along, most often merrily and sometimes barely. I’d be crazy to quit. Michael swept me up from the side of the road and shepherded me safely (happy me) across the mighty Savannah River that marks the border between South Carolina and Georgia. Thank you Michael! I was so discombobulated today that I forgot to ask Michael if I could take his picture so that I can add him to my thank you list of supporters (coming soon). Good-bye Michael. I hope we can keep in touch. Wow. It’s like flying through a white-out and coming out the other side to find a blue bird day (as Lothar likes to call it). 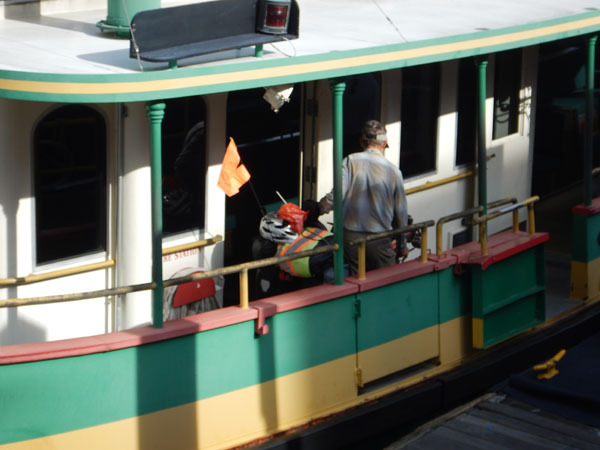 And here’s my man being safely delivered by the water taxi. Lothar reports he had a great ride…apparently a lot less stressful without me around. You gotta appreciate a retired emergency room doctor’s, who has doubles as an extreme (Lothar doesn’t like that word) whitewater kayaker/backcountry skier, sense of objectively assessing risk and negotiating hazards. Now, if only our levels of risk tolerance were the same. 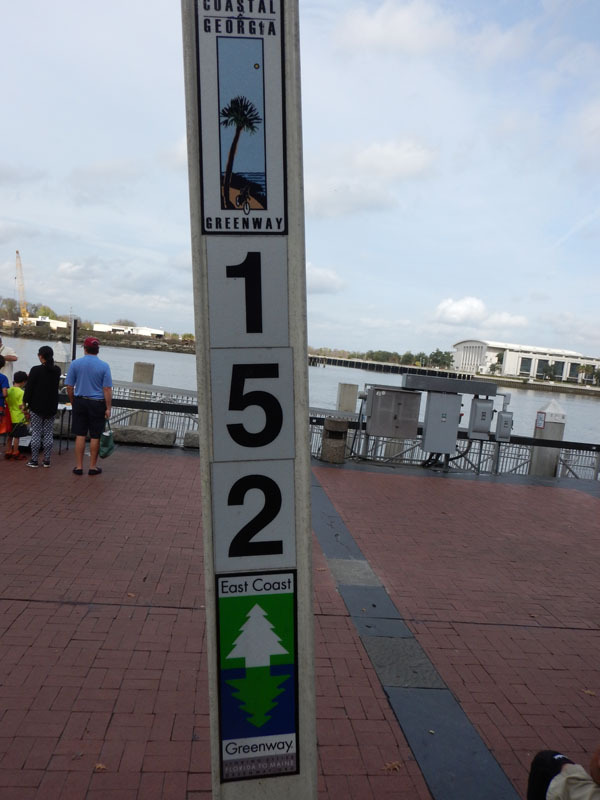 The near mythical East Coast Greenway, a cycling route from Maine to Florida: but we’ll talk about that later. 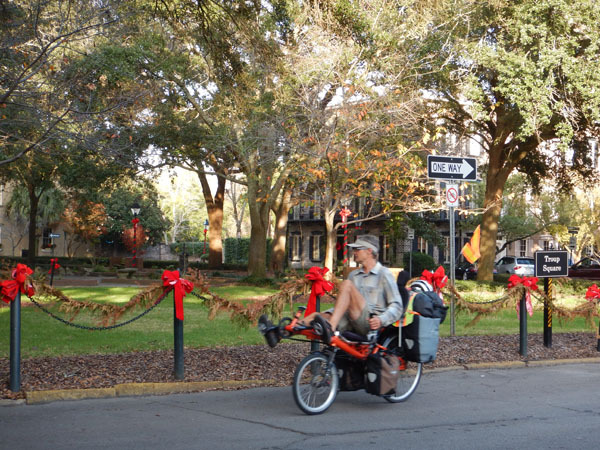 For now, suffice to say there are apparently many people working very hard to identify, secure, and complete a cycling route, not an easy task in the most densely populated regions of the U.S.A.
Way back when, the roads in Savannah were dusty and materials for roads were sparse. 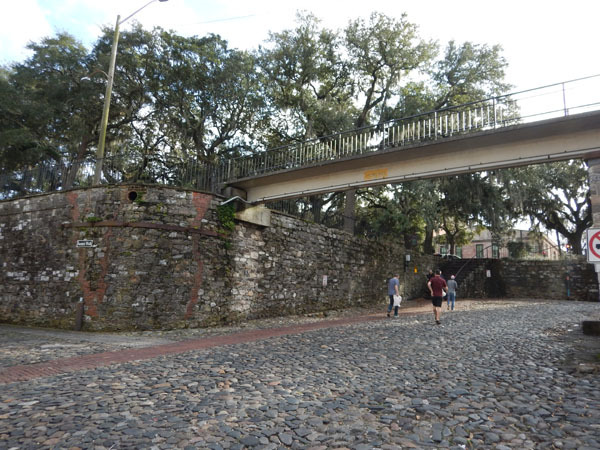 The city resolved the problem by reclaiming rocks, transported from near and afar, that were used as ballast in ships and then heaved overboard at port when they were no longer needed. Stones and brick make a delightful palette of colours and textures for the cobblestone streets that highlight the city. 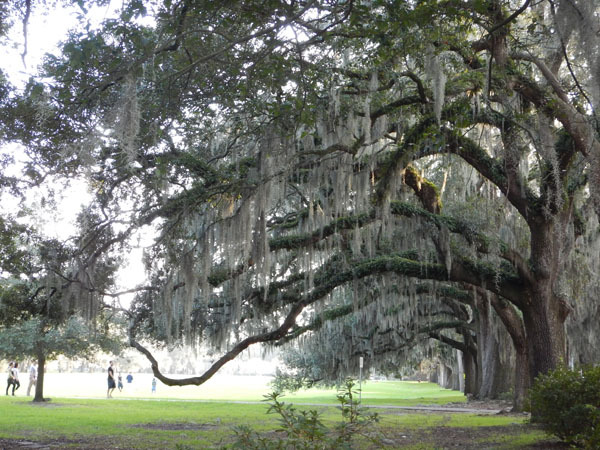 I’m captivated by the live oak trees (that’s their common name: live oak), with their wavy medusan branches, that shelter Savannah from oppressive heat. They, and their little fern friends (that I still need to look up), love the humidity. 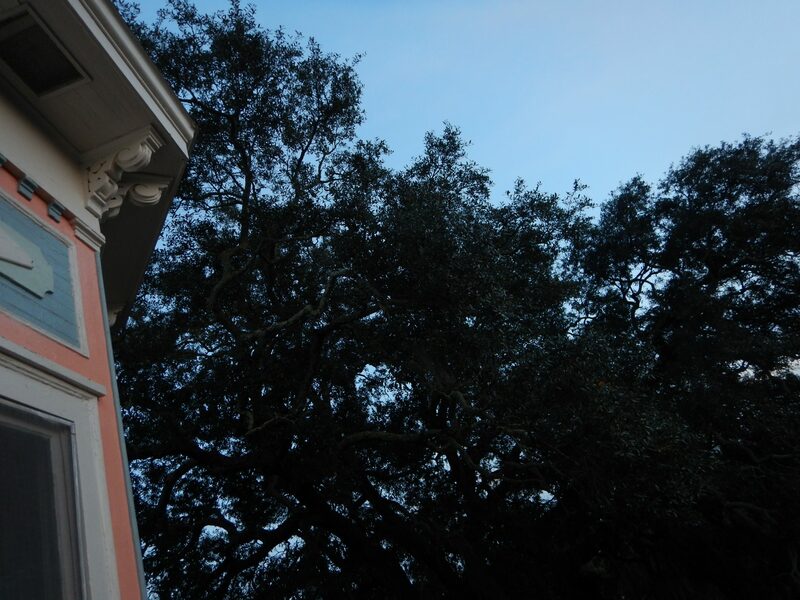 Apparently, live oaks are hurricane resistant, at least more so than some other tree species. The magnolia trees are pretty special too. Apparently, they bloom fragrant blossoms twice a year. How divine it must be to walk about when they’re out. I don’t know. Finding this sign. On this day. When I am missing my family and friends. It’s like the magic of Christmas found me despite pretty much giving up on it. 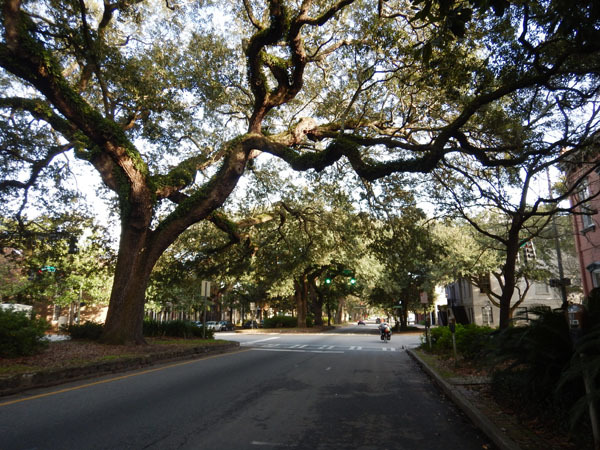 Savannah brims with old buildings and old trees: live oaks, magnolias, palmetto palm trees and more. 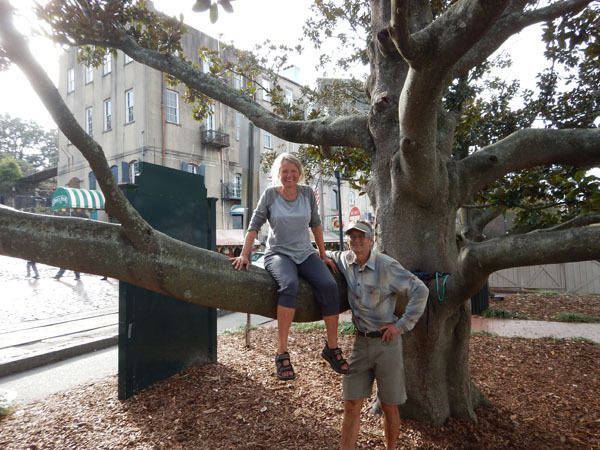 And just when I had completely given up on having a Christmas tree, the tannenbaums of my dreams, live oaks garlanded with Spanish moss, found me too. Arriving at our hostel late, the brick grocery store that I could see from our tree canopy level balcony beaconed. Next thing I knew, I was speed shopping (only one hour left) alongside a cheery crowd of hint of panicked shoppers. 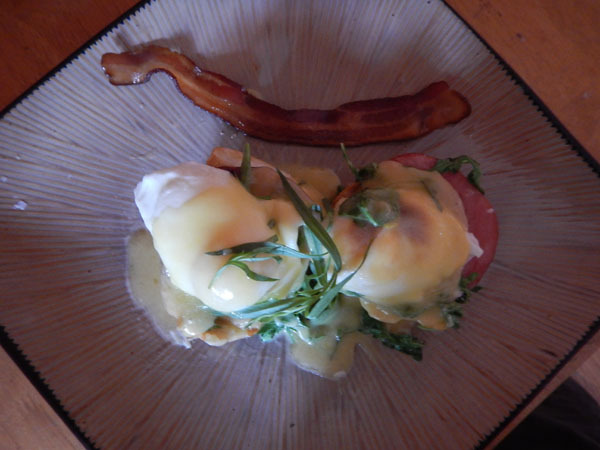 For breakfast Christmas morning I made eggs Benedict on Canadian back bacon and arugula. We accented this with Benton’s Hickory Smoked Bacon, in the traditional southern style (the best bacon I’ve ever had) and Champagne for a fine holiday breakfast. Many thanks to our wonderful house mates for the additions. Christmas Eve is a big day for us at home (Lothar’s family tradition). We’re both missing family, friends, and snow…It’s a scorching 27C out here. Lots of people are telling us that it’s unheard of to be this warm at this time of year. 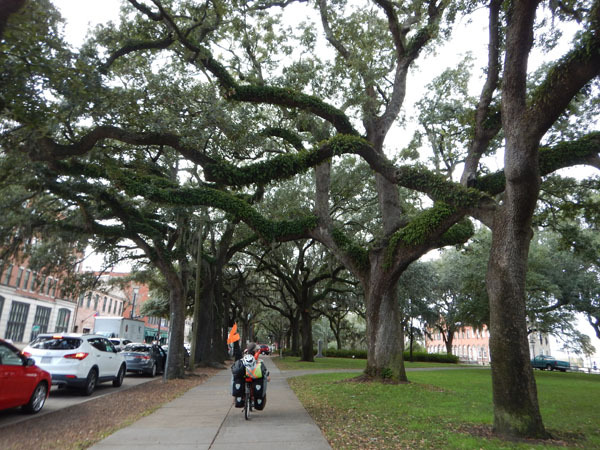 But these trees…they fill me with awe and wonder…anchored roots and sheltering branches. I aspire to be like them. We found reviews for the hostel that we’re at that were polar opposites, good and bad. To which Lothar said (true to form), “Hey, this sounds intriguing. We should stay there.” Our host is warm, interesting, and one of a kind. If you like the predictability of Comfort Inn or anything along these lines, then you might want to stay elsewhere. But we love this place. Now we’re just waiting for the ghosts to come out. Have I told you yet how happy I am that I brought my D.O. (Dutch oven)? Where would I be with out it? 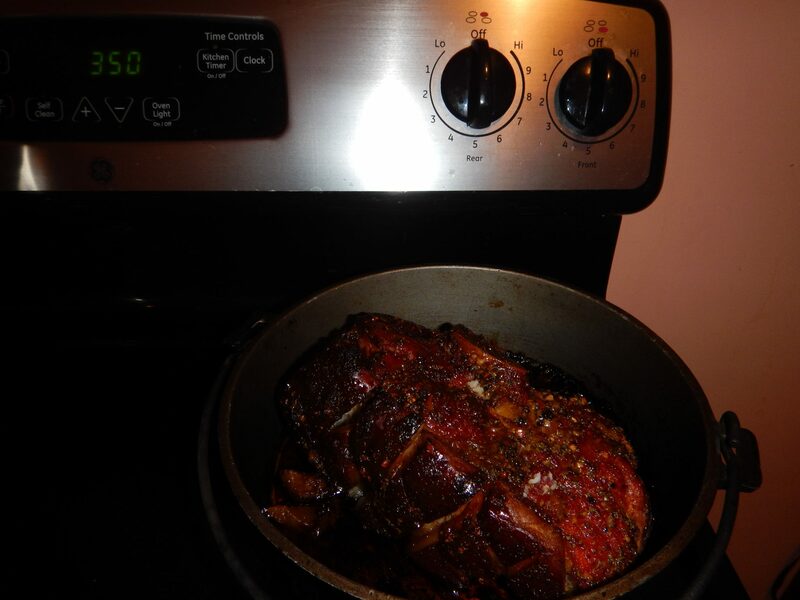 Way down here in the subtropics we had Cajun glazed ham, roasted carrots and yams, mashed potatoes, and arugula, tomato, and avocado salad for dinner. Some photos don’t need captions. And finally, this is why I ride. Believe it or not, I had no idea that my camera was on video…but as if by the magic of Christmas it captured the spirit of so many stories that we have experienced on this bicycle adventure we’re on. I will keep riding. Thank you Michael for shepherding me over my crux and delivering me safely into the best Christmas that a girl who is missing her family and friends could ask for. 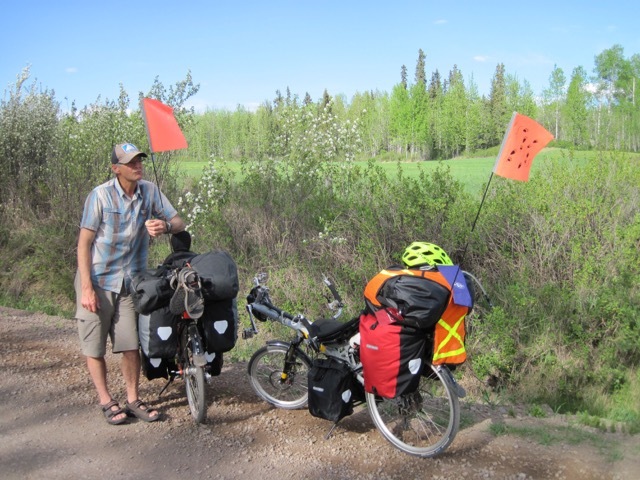 Thank you to everyone who has supported us on this bike touring adventure of ours. It takes a community to make a trip like this unfold like it has, and for that I am grateful. Hi Deb – Merry christmas! Wonderful story, brought tears to my eyes several times because I KNOW, I experienced the grief and sickness of bad roads and drivers and sometimes it is so tough. And so are you tough – way to go my friend. Its why bike riding is really amazing. And you never forget the beauty. Thanks so much for sharing – a tough thing to do as well. You go Gal! and you have a wonderful man! Merry Christmas Karen, Well I suppose the bittersweet truth for both us on both of these fronts is that it is because our lives are so rich that we have these challenges. Peace, love, and happiness to you and your family. Deb and Lothar, Loved this post. I felt as if I was along on the ride with you. Loved the voices of the black men in the background while we were looking at the trees. Wow, you are brave to ride on those roads. Boating is one thing, cars are quite another. Keep up the posts, it makes me feel very connected to you two. We are off to Golden BC in less than a week and we’ll be at Lothar’s Mecca of pow Rogers pass. A very different adventure. 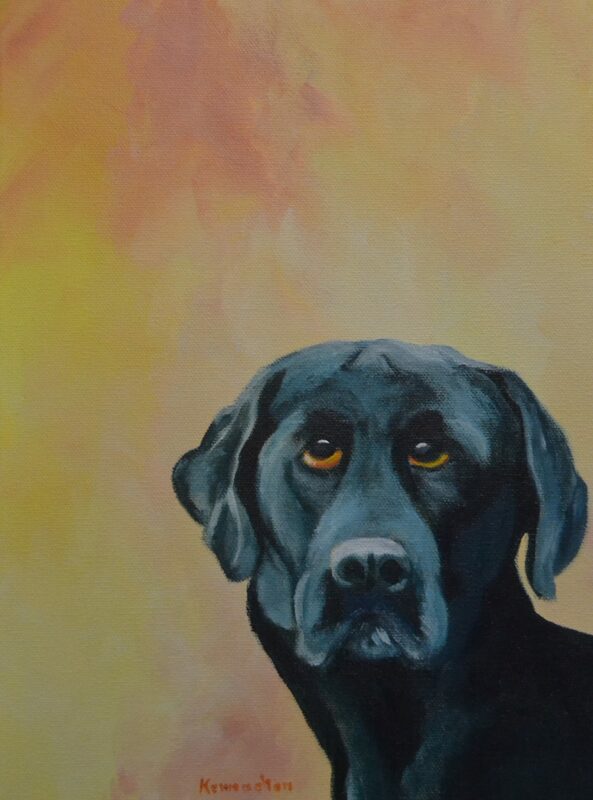 Hi Deb and Lothar, great blog Deb, had me in tears too. Missing Ojie and Emelia. Lve following you adventure and look forward to many more in 2016. Love Mags and Gord. Hi Ed, Great to hear feedback. It was a serendipitous accident. We get such a diversity of people greeting us, from enthusiastic and inspirational cheers to perplexed but curious questions to prayers, pretty much daily. The only negatives have come from vehicles going >50 m.p.h. One of my favourites was the “Bon Courage” that we often heard in Quebec, from elderly ladies sitting in the garden to a young guy half a farm field away. Another is riding by elementary school yards, sometimes the entire school yard flocks to the fence, with great energy and enthusiasm. I was delighted to catch just a little of it from these guys in the park. Oh, I know Lothar is missing skiing and Mecca in particular. Happy adventuring. I hope our travels cross paths one of these days. Thanks Mags! I just starting to realize how many of my friends and family are traveling this Christmas. I’m sure curious about whether or not we’ll meet up in the next little while. Here’s wishing for serendipity. And big wishes for safe and peaceful travels out there on your sailboat adventures. Sara, I think you would love the plants and critters and ecosystems down here.Just need to look in the spaces between developments and degraded and fragmented ecosystems. 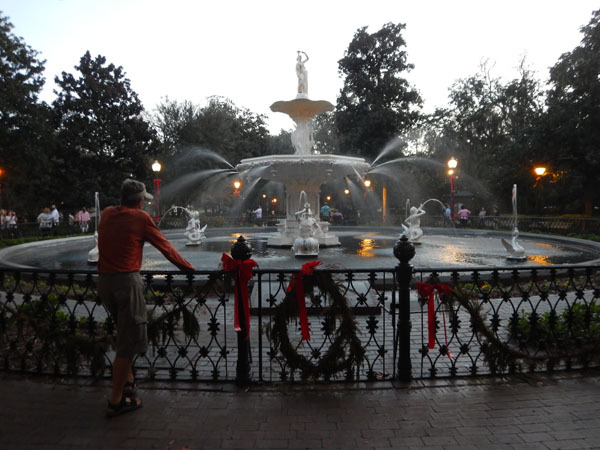 One of the great things about Savannah is how many parks or squares that they have, at least in the old town. Merry Christmas and happy skiing. Thanks for this. As always you make a great support crew, all on your own. Big bear hugs and best wishes for a Happy New Year! …and you gotta love the small town grapevine. Missing my community. Debbie, it was delightful to share Christmas morning with you. Email me if you want a place to stay in Miami. We might just take you up on it. Any chance you will be down there in the next month or so. Thanks for sharing the best bacon of all time with us! Debbie, I will probably not make it down but do let me know when you may get there and if you would like a wonderful home to visit. My parents have a swimming pool and are located next to the University of Miami. Travel well! Hi Matthew, I am all for home visits. They keep me going. We will keep in touch. It was a great day of riding today. I am glad I did not give in to the bus idea…Okeefanokee or bust. Take care! These posts are so exciting to see come into my email. I’m so glad we met, as breif as it was! Merry Christmas to you. I’m so glad to hear the day turned out sunny side up in the end. Sometimes in my mind, as i’m exploring plans for adventures in the future, I forget how hard it might get. You’re such a strong willed women Deb. You guys have biked so far, i can hardly believe it!! The video was so cool, to hear the kinds of things people say when you bike passed. You must be super stong in the legs now too, as well as the mind! How much longer do you think you’ll be biking, do you know? You don’t have to know, I mean, I’m just curious 🙂 Happy adventures in 2016, can’t wait to hear about them! Thanks a lot for the feedback. Yes, sometimes adventures are not all fun. But so far, the challenges are more than worth it. Rather you than me, Deb! I would be petrified, to be travelling on those roads, without a bike lane! Hang in there and hope that the roads are much better again, with at least white lines at the edges, and space for your bike! Happy New Year and save travels. Thanks Ursula, The good news is that our ride through Georgia was much better (and much appreciated by me). Happy New Year! Hi Deb, I’m really enjoying following your and Lothars adventures together as you head on down south. When you slow down your speed of travel you get to truly experience a place and be there as evidenced by your stories. People usually grow through adversity and being challenged by life is how you truly live in the moment. You and Lothar are filling a chest of memories that you will carry with you for the remainder of your days. It’s so good too that you are recording them because the true story is in the detail and that’s the first thing to get lost as time moves on. I too look forward to the book you may right one day??? ?Travel safe Deb and keep the posts coming.Happy 2016 to you and Lothar. Hi Rick, Thanks a lot for the feedback. I am looking forward to writing your part of the story in Nova Scotia. I only wish that we had experienced an east coast kitchen party, music and all, and of course Newfoundland…slow is good…just need to remember we can’t do everything. We did have slow triple berry pie the other day. It was awesome! Happy New Year to you and your family. Happy New Year, Deb and Lothar! I really loved reading about your scary adventure on the highways… So thankful to Michael for you. And Savannah for Christmas. Heavenly. I’m with you on the trees. 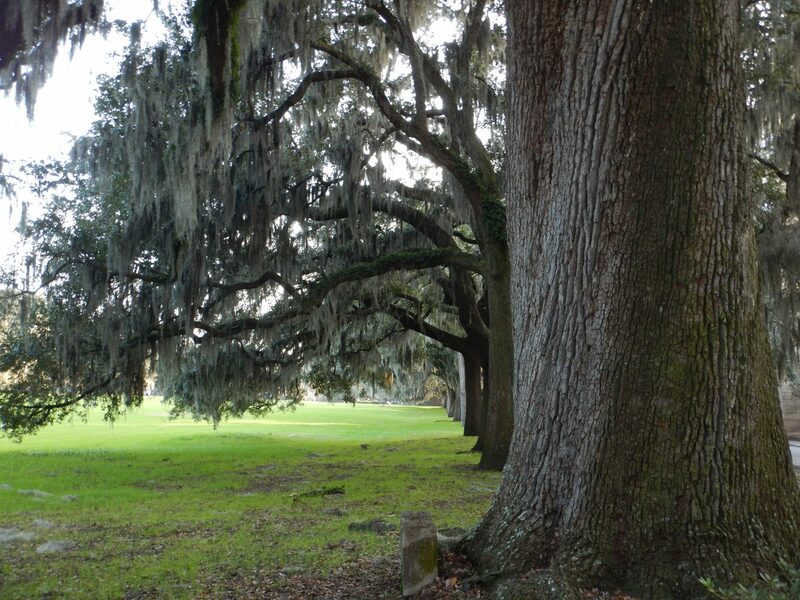 I can hardly be around the live oaks without having to touch them and thank them and offer love and hugs. So beautiful. Your writing is wonderful, and I look forward to reading more. Thank you for sharing your passion for and knowledge about natural history Noni. You are a kindred spirit. All the best for you and your family.